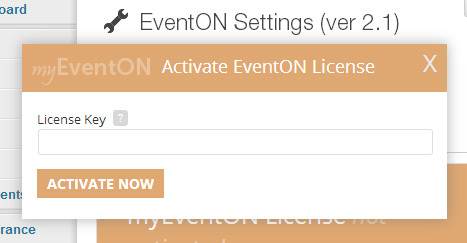 Go to myEventON settings > Addons & Licenses tab and click Activate Now. Then, paste the license code in the pop-up activation box and click Activate Now. If there are any new updates for EventON it should show in this page. WordPress – by default – check for updates to plugins and themes every 12 hours and update your site with notifications if new updates are available. (NOTE: Sometimes it may take several checking and refreshing for WordPress to update the information if there is a new update available. If there are new updates available you will be able to see them in Plugins>Installed Plugins page. You can download the updates by clicking update now on plugins page.